Twitter introduced a new tool " Mute " that allows users to disable tracing accounts of their choice. Interest: better filter messages in the news feed, so as not to disturb its sleep, without the accounts followed not being notified. This feature is currently deployed on the web version of Twitter, as well as iPhone and Android. Limit the "noise" associated with the accumulation of messages on Twitter Timeline is a must for users subscribed to many accounts. To meet this need, Twitter has long proposed creating lists to separate the wheat from the chaff, or simply to conceptualize information flow. Launching "Mute", Twitter goes a step further in this process. This tool will allow you to filter messages from particular accounts "talkative" on its news feed. Specifically, place an account followed silently makes his tweets and retweets invisible its main stream news, and also disables push notifications or SMS messages he shares. 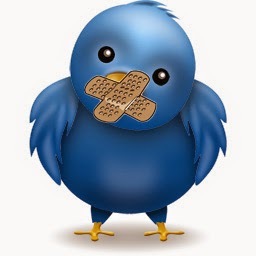 This does not affect the Twitter experience has placed in silent mode, which will not be notified of this measure of restriction and may continue to be favorite tweets of the account in a "mute" and course retweet and respond to messages. Enabling or disabling this tool will be possible directly from a tweet (select "more" option) or by going to the profile page of the account monitoring.